Alan Orr at Sightron tells us that the much-awaited new Sightron scopes, including the 6-24×50 MilDot and 8-32×50 Target models, are scheduled to arrive in the first week of May. You may want to place orders with vendors soon to be assured of getting one from this shipment. 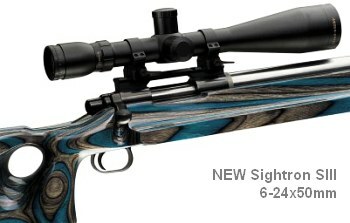 The new 6-24×50 SIII is an all-new 30mm scope that rivals the Leupold 8-25 LRT in design and performance. Available in target dot or mil-dot reticle, the 6-24x50mm offers a full 100 MOA of windage and elevation in a relatively compact (14.96″) scope weighing 21.90 ounces. Clicks are 1/4 MOA . 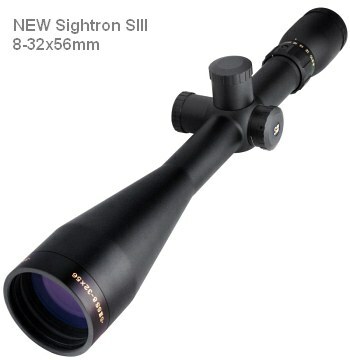 For long-range shooters, the most exciting new offering from Sightron is the SIII 8-32x56mm. This scope has more magnification and a larger front objective than the Leupold 8-25×50 LRT, but with an $825.00 estimated “street price”, the Sightron costs less. Initially, the Sightron 8-32×56 will be offered with 1/4 MOA clicks, and just one reticle, a target dot. Sightron has indicated that other reticles might be offered in the future. Share the post "NEW Sightrons Due in Early May"